*Some restrictions may apply. Scan this card to find out more. Another quite popular card that have no review yet. TWIY*, the poster-child identity for rush and fast-advance. What makes it good is its reduced deck size. But I’m afraid it’s going to lose some play. Why ? Because 12 influence is 3 less than what you’re used to build with. Let’s face it, its ability isn’t very interesting. Oh, sure, you are sometimes happy to not to have to discard at the end of an install-advance-advance-astro-token turn, and sometimes happy to see your agendas or Jackson dodging a Legwork access, but apart if you tried a grail building, have you ever chosen TWIY* for its ability ? And because SYNC had just been released. 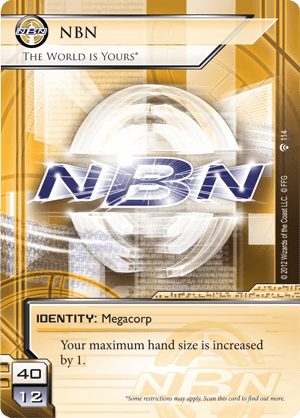 And now, if you want to build a 44-cards NBN deck without taking care of your ID ability, you can benefit of 3 more influence points. And if you want to use your ID ability, chances are that SYNC one is more useful. Seems like TWIY* will join your binder until rotation (if you ever clean your binder from out-of-date cards).